Chicken fillet baked in the oven, in the pot. Puffed with vegetables. 2 green or red pepper, chopped. 2 - 3 chicken breast, fillet, cubed. 3 - 4 tbsp mayonnaise. 3 - 5 tbsp cheese, grated, to top. 1. Arrange chopped onion, green or red pepper, greenery, than layer potatoes into each pot. 2. Put chicken fillet on the potatoes. Sprinkle with pepper, salt, season. 3. 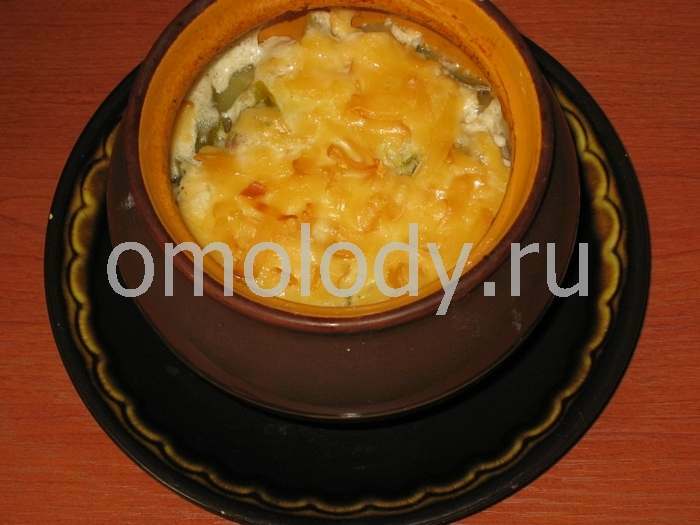 Top with mayonnaise and grated cheese, than bake in the oven until done. I love using clay pots for cooking. The first thing you need to remember is to soak it in a sink or tub full of clean water first of all, for quite a while, or until no small air bubbles surface. Add your food, seasoned to your taste and bake in oven. Wash and pat dry chicken. Pry loose the skin from the breast, carefully, with your fingers. Stuff the chicken cavity with bunches of herbs - celery, parsley, dill, rosemary or basil. Insert a few large, flat basil leaves between the skin and meat on the breast. Rub the skin with olive oil. Place chicken (or pieces) in the clay pot and add potatoes cut in fourths. Add a few pieces of whatever herb you used for stuffing chicken cavity. Sprinkle the whole thing with salt and pepper. Place in oven and cook for about an hour. The meat will fall off the bone and will be heavily fragrant with the herbs.